Permanent Court of Arbitration in The Hague to issue ruling on July 12. 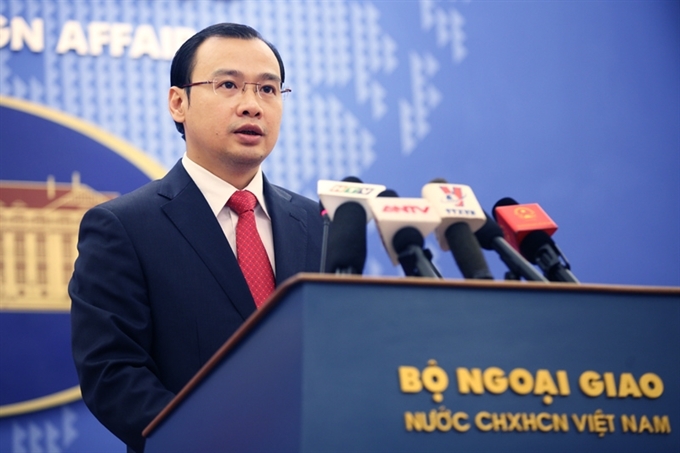 Vietnam hopes the Permanent Court of Arbitration (PCA) will issue a fair and objective decision on a petition filed by the Philippines contesting China’s claims to disputed areas in the East Sea, creating a foundation to peacefully handle disputes in the region, spokesman for the Ministry of Foreign Affairs Le Hai Binh said on July 1 after The Hague-headquartered PCA announced on June 29 that an Arbitral Tribunal will issue an Award on July 12. China immediately reaffirmed that it would not recognize the verdict, stressing that the tribunal has no jurisdiction because the case is in essence related to territorial sovereignty and maritime delimitation. “The Arbitral Tribunal has no jurisdiction over the case and the relevant subject matter, and it should not have heard the case nor rendered the Award,” Chinese Foreign Ministry spokesman Hong Lei said after the PCA set a date for the issuance of the Award. International observers believe China’s actions are not out of character but their next moves would be important for peace and stability in the region. “In the short term, China will launch an international campaign to mobilize as many supporters as possible to support its stance against compulsory dispute settlement,” said Emeritus Professor Carlyle A. Thayer from the University of New South Wales at the Australian Defence Force Academy. China, he went on, will approach newly-elected Filipino President Rodrigo Duterte to entice him into bilateral negotiations and thus attempt to undermine the Arbitral Tribunal’s finding. “China may even instigate a vote in the UN General Assembly, according to recent reports,” Professor Thayer added. Since ASEAN and China faced disagreements in terms of the wording in their joint statement at their Special Meeting in Yunnan on June 14, Professor Thayer recommended the ten-state bloc remain alert about upcoming developments, particularly in the medium term, in which China will continue to consolidate its civil infrastructure in the East Sea to demonstrate that it is in effective administrative control over the Spratly Islands. Last month Cambodian Prime Minister Hun Sen reiterated the nation’s stance that it would not support the PCA’s ruling in this case and would never support any declaration by ASEAN states or others to support court decisions relating to the East Sea. “The CPP regards the South China Sea / East Sea issue as a matter between countries concerning sovereignty and not a matter between ASEAN and China,” he said at a Cambodian People’s Party (CPP) ceremony in June. “The CPP appeals to every concerned country to resolve the issue peacefully. Only countries concerned will be able to resolve this problem. ASEAN is not able to work on behalf of those countries’ concerns,” the nation’s Khmer Times quoted him as saying.